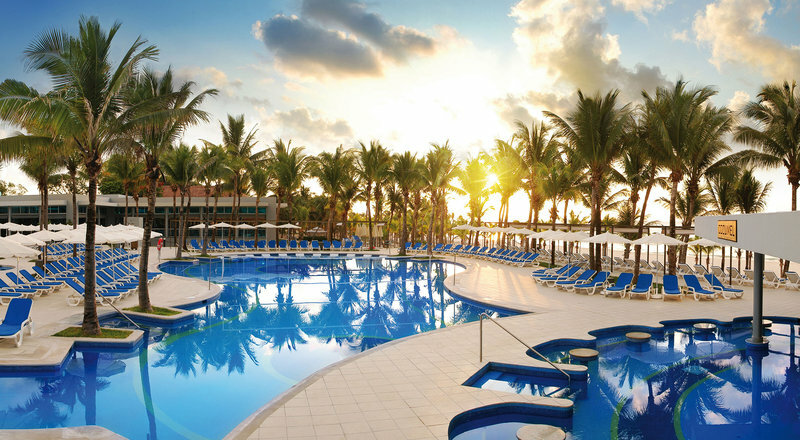 The Hotel Riu Yucatan, is a small Caribbean oasis in a marvelous setting surrounded by palm trees and crystal clear water and is just a 10 minute walk from Playacar’s shopping and entertainment area. It is also adjacent to a championship golf course. This newly renovated beachfront Mexican hotel has 507 rooms and all have a mini-bar and liquor dispenser, safe and a terrace or balcony. There is a fee for WiFi in the room however in the lobby it is free. You have your choice of five restaurant, buffets with live cooking stations and special evening themed buffet (three times a week). The a la carte restaurants offer a choice of “Sicilia” Italian restaurant (à la carte, buffet starters and dessert), “La Margarita” grill and steakhouse (à la carte), “Shanghai” Asian restaurant (buffet), Mexican restaurant at Beach Club; à la carte, buffet starters and dessert. There are also five bars including a swim up bar and pool bar for your drinking pleasure. Non-motorized water sports are included. After a long day head to the spa where you have your choice of treatments to relax you. Every evening live entertainment and music provide the perfect show and if you want to dance the night away head to the disco. The kids can have fun all day at the RIULand mini club where they will make new friends.